We will feature 3 dates to qualify for the championship flights. There will be two designated Thursday rounds and one Saturday round in which you may qualify. Players have the option to play in all three events. If you choose to play in more than one qualifier the low score will be used as your qualifying score. Players must sign up in advance and declare prior to each qualifying round that they will be participating that day. Any qualifying score ties will be broken as follows: (includes ties for seeding rankings) Best back 9 score, last 6 holes, last 3 holes, last hole. If still tied the best score will be chosen by lot. There will be 8 players in the regular division and senior division champ flights if we fail to get 18 qualifiers. If we get 18 or more qualifiers in either division we will have 16 players in the champ flights. Senior division is age 50 & over. 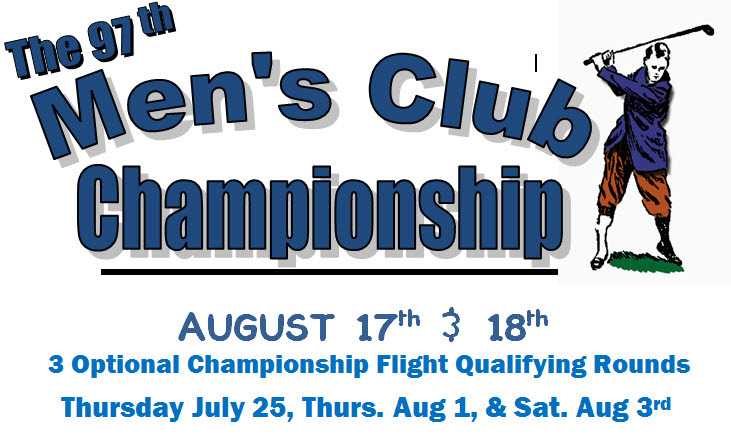 Anyone not qualifying for the championship flights or not making the champ flight will be flighted by handicap. Hors d’oeuvres will be provided as part of your entry fee. We will host a calcutta on Friday night, August 16th , starting at 6:00 pm, with hors d'oeuvres included as part of your entry fee. Spouses and non-tournament members are welcome to attend for $13.